3 buildings, 9 residential units. reception, WLAN in reception area, WLAN in pool area, washing machine. backyard, BBQ area. loungers. parking spaces in 20 m.
bright and welcoming furnishings. on the ground floor. kitchenette. 3 gas burners, refrigerator with freezer, microwave, coffee machine. shower, bidet, toilet. satellite TV, wireless LAN. open fireplace, gas heating. terrace, backyard. outdoor furniture, parasol. 3-room apt. with separate entrance. living / dining room, 1 sleeping facility. bedroom, 1 double bed.sleeping alcove, 1 bed.bedroom, 2 single beds. 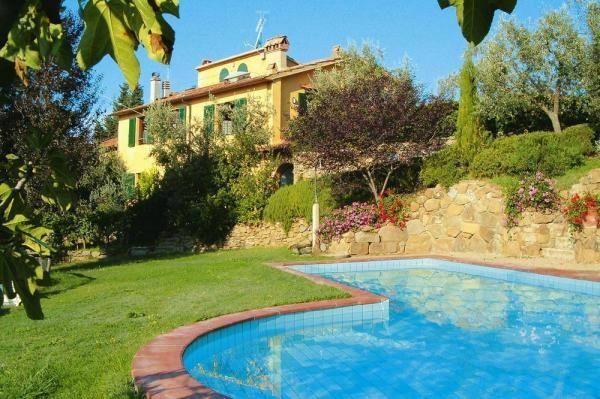 bakery 1 km, shopping 1 km, shopping mall 7 km, bar 4 km, café 4 km, restaurant 4 km, highway 18 km, train station Pistoia 18 km, airport Florenz 48 km, location Lamporecchio 7 km, location Vinci 8 km, horseback riding 4 km, 9-hole golf course 13 km. In der Hochsaison wird ein Pizzaabend 1x pro Woche vom Inhaber für alle Gäste kostenlos angeboten. playground. baby cot (for babies up to 2 years (included), in addition to max. occupancy) , highchair, please reserve.